LIC’s New Jeevan Anand (Table 815) is by far, one of the most popular and widely accepted insurance plan from insurance behemoth – Life Insurance Corporation of India.New Jeevan Anand is an Endowment Type of insurance plan where maturity benefit- which includes Sum Assured, Bonus and Final addition bonus- is payed at the end of the term. The most sought after feature, which underlines the popularity of New Jeevan Anand is it’s additional life long Insurance Coverage. 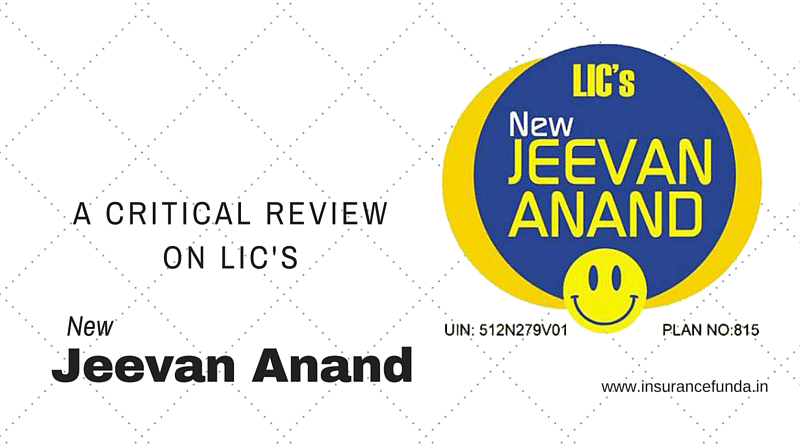 Let us have a technical analysis on how much additional premium one should pay for availing the life long insurance coverage of LIC’s New Jeevan Anand. The best method to evaluate the cost of life long insurance coverage of New Jeevan Anand is to compare it with the premium of LIC’s New Endowment Plan (Table 814). New Endowment Plan is more or less similar to New Jeevan Anand if the life long coverage is excluded. The chart given below shows the premium difference of New Jeevan Anand and New Endowment plan with increase of age. Sum Assured considered is Rs. 5,00,000 and term considered is 21 years. Just hover the mouse over the graph to see the exact premium. Now let us have a look at the total additional premium paid during the payment period of the policy and the additional benefit obtained thereof. Just place mouse over the graph to get more details. So we can easily understand that at lower ages Additional Life long coverage feature become very much attractive. But after 40 additional premium comes to more than 20% of the life long risk coverage. You can calculate the approximate maturity value of New Jeevan Anand and New Endowment Plan using the software provided here. The maturity value of Jeevan Anand is quite reasonable when risk coverage is also considered. Endowment type plan where the maturity payment is paid as single lump sum amount. With profit plan where the investment profit is shared to policy holders as bonus and Final Additional Bonus. Normal Insurance Coverage equal to 1.25 times of Sum Assured and bonus accrued till date will be available during term of policy. Double Accident Benefit and Extended Permanent Disability benefit available through out premium paying term. Life long Insurance Coverage equal to Sum Assured available even after the maturity of the plan. A special option to en cash the death coverage by surrendering it or take a loan from it in case of an emergency (After the Maturity). Income tax rebate available under section 80C for premium paid. Calculate your Income Tax using Income Tax Calculator. Maturity amount and Life long coverage also not taxable u/s 10D of Income Tax act. Read More: Calculate Insurance Coverage required for you using Human Life Value Calculator.